The term pronation refers to the excessive rolling in of the foot while standing, walking or running. Some pronation is normal in every step, but too much can cause agreat range of problems throughout the body. 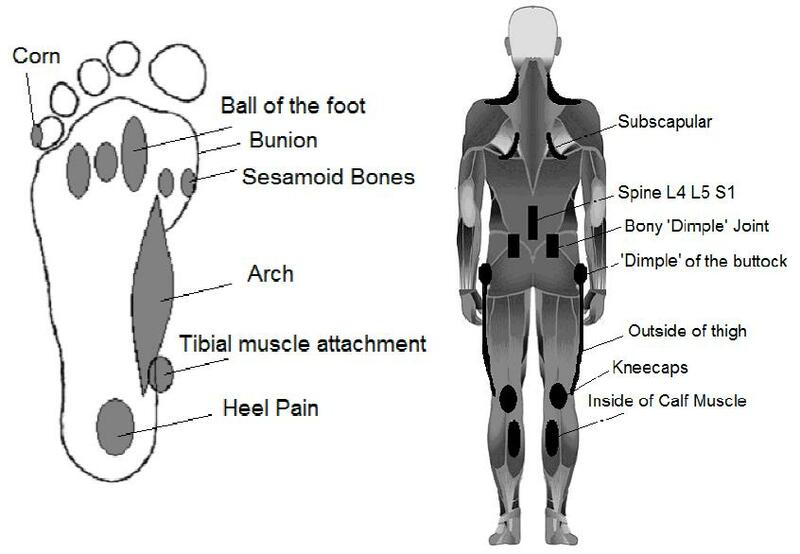 Below are diagrams of the foot and body showing some (but not all) of the most common places that foot pronation can cause pain. Be aware that these problems will affect 40% of the population at some time in their lives, while only around 5% of the population seek treatment. This means that a vast number of people are suffering leg, hip or back pain that does not respond well to symptomatic treatment of the sore spot because the cause of the problem is never addressed. Think of your body in terms of a multi-storey building. How can the 5th floor window frames be fixed if the crumbling foundations are never repaired? Treatments such as rest, massage or antiinflammatory medication will help to relieve the pain until the activity that causes the pain occurs again. Unfortunately, when this activity is standing or walking, relief is short lived. Visit the podiatrist for a comprehensive examination of your complaints. Treatment of an underlying foot problem may well be the answer to widespread and ongoing pain.